During the Valletta Pageant of the Seas 2016 edition. The Grand Harbour will host the largest spectacle of all time during the Valletta Pageant of the Seas on the 7th of June, from 5.30pm onwards. Although the show will be visible from many areas around the Grand Harbour, the public is encouraged to watch from Valletta in order not to miss any part of the show which will go on till late in the evening. Roads between Evans Building and Crucifix Hill (next to Valletta Waterfront) will be closed for traffic (except for residents) between Thursday 7th June 9AM and Friday 8th June 1AM. The public is encouraged to plan ahead and to make use of public transport which will be operating as usual for weekdays from 3pm onwards, despite it being a public holiday. Valletta circular route number 133 will be diverted on the 7th of June from 6pm onwards. From Old Bakery Street, the bus will move towards Marsamxett Road, Great Siege Road (next to Hotel Excelsior) to Valletta Bus Terminus, without passing from Ta’ Liesse and Floriana. This route will not be stopping at the following stops: Iermu, Imgerbeb, Kavallieri, Barrakka, Liesse, Lascaris, Kurċifiss, Polyclinic, Boffa. Shuttle ferry service will be operating between 11.30pm and 1.00am. 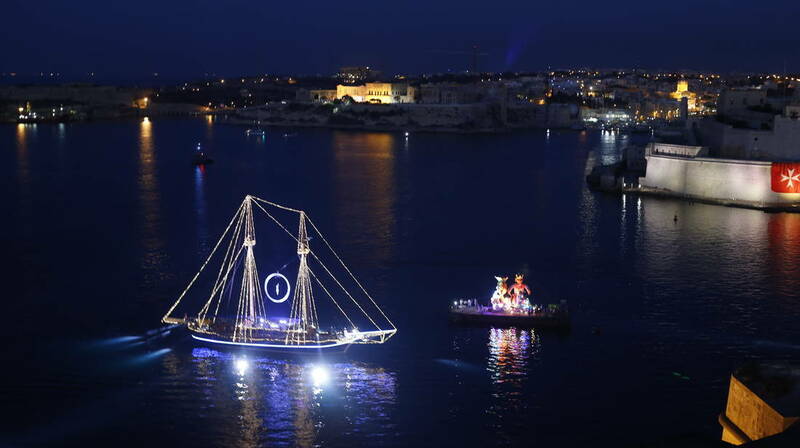 Around 1,000 people are taking part in the Valletta Pageant of the Seas, which will offer a unique spectacle in the Grand Harbour. One of the most highly anticipated activities during the day is the show by La Fura Dels Baus, which will see around 400 Maltese participants working hand in hand with the Spanish company. La Fura Dels Baus will put up a spectacular show, as they return to Malta with a new choreography for the Valletta Pageant of the Seas. The latter debuted in Malta during the European Capital of Culture opening celebrations in Valletta, where they put up a grand show at Triton Square. The narrative is inspired by the relationship that exists between the Maltese and the sea, with a surprise in store for those watching. The group’s philosophy is centred around redefining spaces by using non-conventional ones; a quality which will emerge during the show in the Grand Harbour. The Grand Entry will open the afternoon activities; an epic pageant during which the Grandmaster, together with In Guardia, enters the Grand Harbour on the Fernandes which will be decorated for the occasion, while accompanied by a number of private boats. Wearing their finest uniforms, In Guardia will accompany the Grandmaster on his arrival in the Grand Harbour, while setting the scene for the rest of the Valletta Pageant of the Seas. The group is well known for its re-enactments of various historical events in Malta, and has also performed in countries such as China, Greece, The Czech Republic, Sicily and Germany. A number of competitive races will also be held on the day, during which hundreds will participate. The general public is invited to take part in L-Għawma Toni Bajada; a swimming activity which will see around 200 participants swim across the Grand Harbour from Fort St Angelo towards Valletta. This swim celebrates the legendary figure of Toni Bajada – a historical figure who was known to relay important information he managed to gather from the Ottomans to the Knights, by swimming between St Angelo and St Elmo during the Great Siege of Malta. Those interested in taking part are invited to register themselves on the day at 16.00 at Barriera Wharf, next to the old fish market (Il-Pixkerija). A regatta involving around 16 boats will also be happening, during which both Maltese and international rowers will be racing in a triangle from the Old Customs House to Ras Ħanżir and back. The winning team will receive the Palju de Vallette; a black banner designed by Antoine Farrugia, adorned with baroque decorations representing each of the seven districts and boats taking part in the regatta. The Valletta Pageant of the Seas will also see more than 20 participants who have used their creativity to create their own rafts from recycled materials, which will be raced in Tellieqa Telliqun, without the help of motors or oars. 12 Chaudron powerboats will also be presenting their own choreography in the Grand Harbour. This event is being organised by the Valletta 2018 Foundation, in collaboration with In Guardia, the Malta Tourism Authority, Birkirkara St Joseph Sports Club, the Malta Rowing Association, Chaudron Powerboats, Surfside Charter Company Ltd, Mad About Video Ltd, La Fura Dels Baus, St Catherine’s V.M. Musical Society Żurrieq, St George’s Fireworks Factory and Independent Fireworks Factory. Supported by the Armed Forces of Malta, the Malta Police Force, the Civil Protection Department, Red Cross, the respective Valletta, Floriana, Senglea and Kalkara local councils, Arts Council Malta and Heritage Malta.